During the summer of 2019, Laurens County School District 55 elementary and middle school students have the chance to participate in the second season of Laurens Lifelong Literacy (L3) Summer League. The mission of the L3 Summer League is to provide structured athletic opportunities that assist in the development of Laurens District 55 students’ academic, physical, mental, and emotional goals. L3 will be an annual summer program that fuses co-ed basketball and education through its three goals: live, learn, and literacy. With the vision of “Laurens Lifelong Literacy”, L3 provides three months of unique experiences that crossover the rules, camaraderie, and lessons taught on a basketball court into the students’ inner-selves, classrooms, and lives. L3 Summer League provides free opportunities for 9-13 year old girls and boys across Laurens County School District 55. Consisting of two age brackets, the elementary bracket is for rising fourth (4th) and fifth (5th) graders and the middle school bracket is for rising 6th -8th graders. The league hopes to serve approximately 200 total students with player registration forms being available in schools and online starting in mid-February 2019. Registration applications are due by April 26, 2019. L3 Camp is June 10-13, 2019. A parents and coaches meeting will be held on May 18, 2019, at 10:00 a.m. and practices will begin June 17, 2019. The first games take place on June 15, 2019, at the L3 Kickoff Jamboree and the league wraps up August 3, 2019. Games take place weekly on Thursday evenings and Saturday mornings with the first week of July being an off-week for all participants. Off the court, L3 provides educational growth for students through a unique character awareness curriculum created by A.Bevy - a 501 (c) 3 arts and education nonprofit. The summer league develops and promotes literacy through its annual literary pick and the events that surround the selected book’s lessons. The 2019 L3 literary pick is The Crossover, by Kwame Alexander. All players are required to read the selection as a foundation for other summer activities, which will consist of introspectively fueled experiences such as crossover days, guest speakers, goal planning, team building, city government day, the community Hoop Dreams basketball tournament, and Laurens District High School Alumni basketball game. We encourage students to sign-up as soon as possible for this free opportunity. 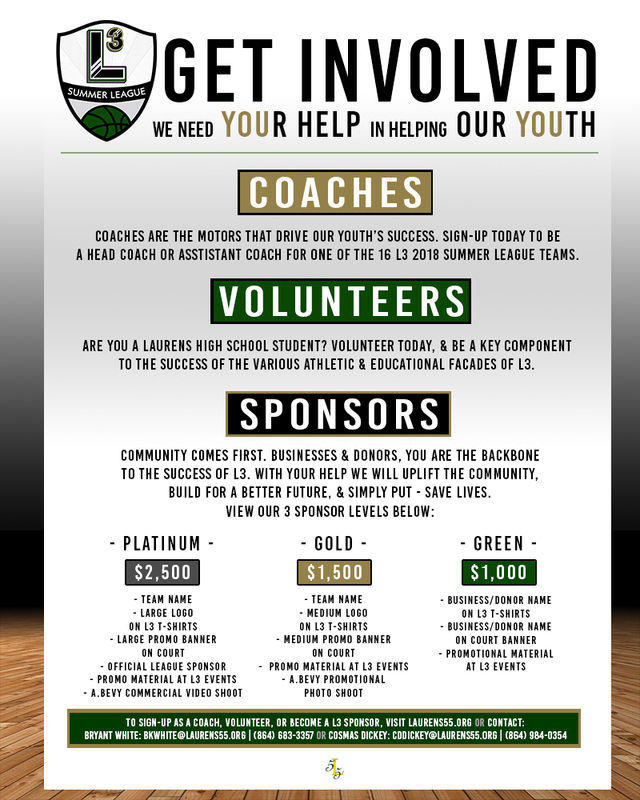 The L3 Summer League is also looking for coaches, assistant coaches, volunteers, and sponsors for the 2018 season. For more information, you can visit the Laurens District 55 website: www.laurens55.org or contact Bryant Kirk White, Commissioner, L3 Summer League, (864) 872-2508, bryantwhite@abevy.org.